In this series of 30 daily articles celebrating the upcoming 30th Anniversary of Super Mario, various members of the Nintendo Life extended family will share their memories and thoughts on the iconic franchise. Next up is reviewer Jonathan Town. Looking back now, I realise that growing up in Wakefield (West Yorkshire, England) was a blessing; there was a really great import scene, some fantastic arcades and me and my mates thought nothing of having the latest Japanese games. This was back in the days of huge delays between NTSC and PAL releases and when 60hz actually mattered. It made me the man I am today and fostered a love for fine Japanese cover art. During this time I used to frequent a local 'Computer Club' once a week, which was bizarrely hosted inside a church. People would turn up from miles around, hauling consoles and huge CRT televisions into a tiny little hall. Computer Club also became the place to check out the latest imports, too; attendees would bring along such delights as Neo Geo and PC Engine consoles, plus there were plenty of sweets to eat. Super Mario World was one of the games we used to play an awful lot; a few folk had the Japanese import version and many hours were spent figuring out the secret exit to Cheese Bridge or discussing how awesome the honky-tonk piano music sounded. After about six months of spending every Sunday afternoon resetting the save file and speed-running for 96 exits, word on the street was this guy Mick had acquired a brand new Mario game. Not only that, he would be bringing it along to Computer Club that very week! Bear in mind that this was before the days of internet knowledge; most gaming related news travelled by mouth and it was easy to have the wool pulled over your eyes. It was pretty common to hear a kid claiming to have Sonic on his SNES because his Dad's brother worked in China with Mr. Nintendo. So we were excited, but also a little dubious. Besides, how could Nintendo ever top Super Mario World? I can clearly remember the crushing disappointment of discovering the 'new' Mario game was, in fact, Super Mario Bros. 3 on NES. The PAL (and therefore 50hz) version. 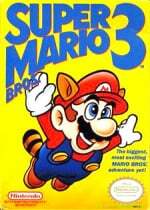 See, here in the UK, Mario 3 was released AFTER Super Mario World came out in Japan. There was immediate confusion caused by the newest Mario game being on an older console and with worse graphics – until we realised that we had been living in the future for half a year and the UK was only just beginning to catch-up. So for me, I will always associate Mario 3 as the sequel to Mario World. To this day, it remains the only Mario game (in the main series) that I haven't completed; as a child, I dismissed it due to already owning Super Mario World (I know, I'm a fool, but I was young). One day I will make amends, but for now - Super Mario Bros. 3: I'm sorry, but you arrived a little too late. I had a wee go on both Super Mario Bros 3 and Super Mario World again last night, and I was reminded, again, how I find the controls in SMW just a whole order of magnitude more satisfying than SMB3. The very noticeable sliding in SMB3 just makes it a lot more difficult that it needs to be at times, imo. I was constantly dying and usually I didn't feel it was totally my fault but more because the character was just sliding more than I felt he should most of the time; such that my judgement was constantly off. It's still a total blimmin masterpiece (not even up for question), and in a few ways still even has an edge on SMW, but I just wish I could play SMB3 with SMW movement for Mario. Boy would that just be utterly sublime. If you do ever decide to make your way through SMB3 to completion, I would suggest playing the Super Mario All-Stars version. It just tweaks and "perfects" the original in almost every single area and ultimately makes it an even better game imo. You also won't really find that massive conflict between how good SMW looks as compared to the original SMB3 either, since it looks pretty much on-par with SMW and in some ways even has some added visual elements, like more parallax at times, which should be a good start in terms of really buying into it and giving it a proper chance. Being from the UK and never owning a NES until later life, my first taste of SMB3 was in the All-Stars mix. I thoroughly enjoyed it but always sucked at it, whereas I blitzed through SMW with ease. Revisiting these games is satisfying every single time and this always serves as a testament to the sheer quality of both these titles. My best Mario memories are all of SMB3 and SMBW. I had no idea about the different release schedule in the UK, pretty interesting stuff. I'm so used to lurking on Zelda forums that when I saw the phrase "timeline confusion", I immediately assumed there was going to a heated debate on whether NSMBU takes place before or after the "kill Bowser with 120 stars split". It happened to me too. The first game I've ever played is Super Mario World. So, when I eventually played Super Mario Bros, SMB2 (Doki Doki) and SMB3, all of them felt boring in comparison. "Where's Yoshi?! The flying cape?! Where did they hide the colors?". I did grew fond of'em all eventually, but Super Mario World is always gonna be my number 1. I remember back in second grade, the older of our two classroom computers had a ROM of Super Mario World and at every chance we got all the guys would take turns playing. I even remember one evening, during a school play, when all of us were in full costume playing SMW as we waited to be called down for our scene. It was a tragic day indeed when that computer finally gave out and we were left without our favourite game. Our young souls felt crushed. This a really good story Jonathan, it's like reading about a parallel dimension as I can't imagine playing World first then SMB3. The good old days of swapping secrets to games at school and If you didn't subscribe to Nintendo Power you really were left out in the wilderness. The internet truly is the best gift gamers have ever gotten, except for the trolls at GameFAQ. I played World before 3 myself, but I never knew that it was the newer out the two at the time because I was young. However, 3 coming out after World in the UK is a fact I didn't know 'till now and I think that's interesting, if a bit unfortunate. But yeah, get to playing 3 at some point. It's good. I only got to "really" play it after World, and I still like it way more than World. I only had an SNES but remember really wanting an NES to be able to play Mario 3 that I had seen so many times and played at friends places. So finally one day, we got All Stars! SMB3 will never get old for me. Love it! Playing it on the nes is even better. That was a enjoyable read. You would have to be a dedicated gamer to haul around a crt tv. "Besides, how could Nintendo ever top Super Mario World?" I'm not sure they ever did, in all honesty. "(I know, I'm a fool, but I was young)"
I would have not used to word "fool" to describe a younger version of my self in the article if I were its author. It's very negative.